Our apple season here has been and gone, but for a good couple of months there was quite a frenzy of apple cooking and apple eating in the Bangers & Mash household. We have a lovely Discovery apple tree in our garden, which gives us a good crop of pretty red apples fairly early in the season. We can normally start picking them from around mid August. Well, most years. Last year we only had six apples from the tree but it was a terrible year for apple growers all over the UK. This year we had a splendid harvest. Discovery is a wonderfully sweet and crisp apple. The skin is so red it leeches into the white flesh turning it pink. And when you juice them, the apple juice is the most gorgeous shade of pinky-red. The only problem is Discovery apples don’t store well, so I do find that late summer and early autumn become our apple-obsessed months, with practically every meal or snack featuring apple in some form or another. We’ve been baking, chutneying, pureeing, drying, juicing, freezing and crumbling! But as soon as they’re gone, I miss them terribly. So when an invitation came from Waitrose to try some of their English apples, it couldn’t have come at a our better time. Waitrose runs a Grow & Sell campaign with schools, encouraging seven to eleven year olds across the UK to grow their own produce and sell it to Waitrose customers. They are now taking this a step further and encouraging families to grow their own apples at home. So along with my apples I was also delighted to receive a Scrumptious apple tree to plant out in the garden alongside our Discovery tree, which will extend our apple season next year considerably. Scrumptious is perfect for smaller gardens as you don’t actually need another tree nearby as a pollinating partner to produce a bumper crop of apples. The sweet eating apples are ready to pick in September and the tree is also happy in a large pot so long as it is kept well fed and watered. With my bumper bag of Coxes apples from Waitrose I decided to try out some recipes from their website, where I found some rather tempting dishes from top food bloggers. 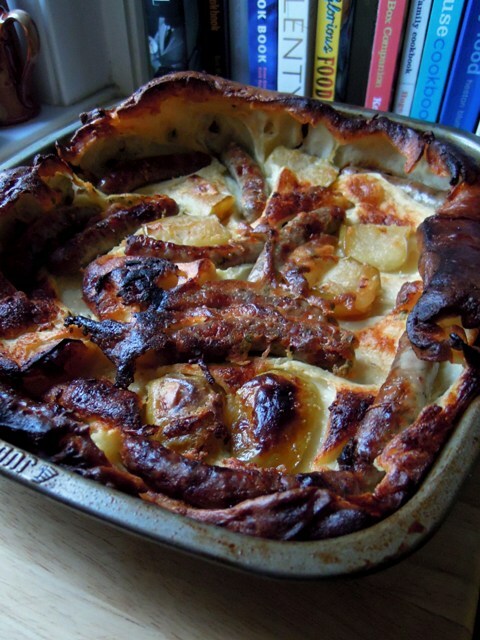 This Sausage and Apple Toad in the Hole from Katie at Feeding Boys caught my eye straightaway. You probably won’t be surprised to hear that toad in the hole is a bit of a favourite in our house. I’ve never thought to include apple before and it was a big hit with all my family. We made ours with Waitrose pork and herb chipolatas and it’s certainly a dish I’ll be making again. 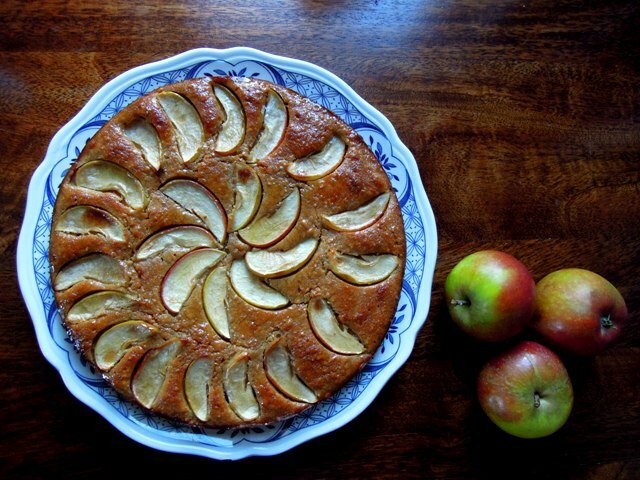 I also baked this yummy Apple Cake from Michelle at Utterly Scrummy. It’s a delicious cake to serve slightly warm with yoghurt or ice cream, or I think it would work equally well as a pudding with lashings of homemade custard. My daughters also appreciated it cold as an after-school snack. Eve’s Pudding is always very popular with my clan and so I used the rest of the apples to rustle one up. It’s a recipe my Nana Barbara gave me and it’s a proper, old-fashioned, comforting sort of a pud – what I call a ‘hug in a bowl’ – with sweet, juicy pieces of cooked apple enveloped in a soft, fluffy sponge. Just the kind of pudding I crave when the weather turns nippy. What’s even better is it’s so easy to make. Preheat the oven to 170°C / gas mark 4. Slice the apples thinly into a greased ovenproof dish. Sprinkle over the demerara sugar, grated lemon rind and water. In a large bowl, cream the butter and sugar together until pale and fluffy. Add the egg a little at a time, beating well after each addition. Fold in the flour with a metal spoon and carefully spread the mixture over the apples. Bake for 40-45 minutes until the apples are tender and the sponge mixture cooked. If you’re using an Aga, bake in the bottom of the roasting oven with the cold plate in the middle of the oven for 15 minutes, and then move to the bottom oven for 25-30 minutes. 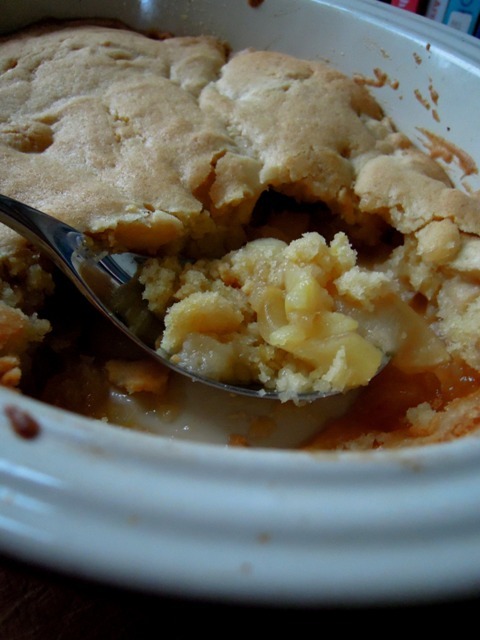 What are your favourite recipes to cook with apples? Disclosure: Waitrose provided me with a complimentary apple tree and £10 shopping voucher for this post. All opinions are totally my own. It is so good – the apple and sausage are a great combination. Love the apple cake and Eves pudding, but it all looks yummy. We have one lone apple on our newly planted tree in the garden but luckily still have lots of apples coming our way from my mother in law, so very glad of appley inspiration, thank you. I hadn’t heard of the Waitrose Grow & Sell project in schools, but what a lovely idea! Shall look out for news of it. 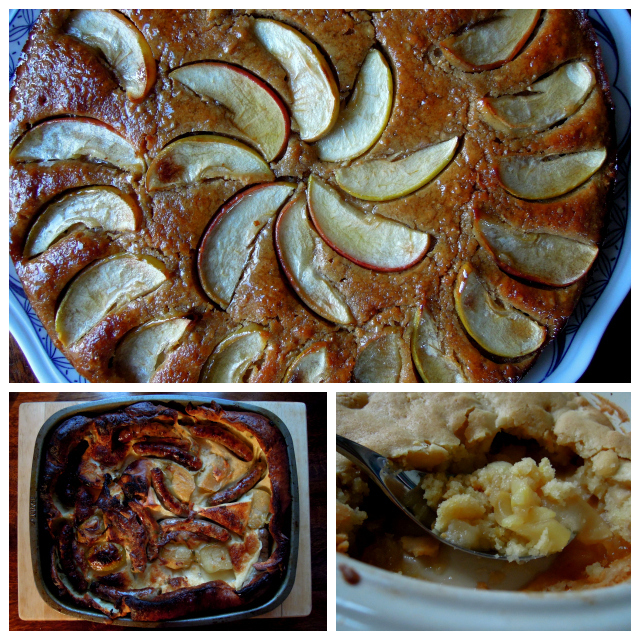 And what a gorgeous collection of apple recipes you’ve baked, great idea of Katie’s to add apple to toad in the hole, also a bit of a favourite round here. Delicious looking cake and eve’s pud too! After your tip off about Eve’s Pudding a few weeks ago I also made one and will post it soon…..and of course shall mention your wonderful apply collection! Still overrun with apples around here, but then I do live in the centre of Apple Land Herefordshire!